Finding a great book is like discovering gold, yet acquiring such a treasure rarely happens by accident. Often, we must be wiling to explore unchartered territory. We need a plan. To understand the “why” behind the plan, take a few minutes to visit Books for Boys: Why it Matters. Godspeed as you embark on your adventure! May your bookshelves be lined with great treasure. You may notice that some of your favorite books (and many of ours, like The Chronicles of Narnia and The Hobbit) don’t appear on this list. Rather, I’ve attempted to include titles which are somewhat “off the beaten path.” The majority of the list was compiled with the help of my boys. They love their books. Leonardo da Vinci by Paolo Cardoni – Stories of unusual children who changed the world. Sam’s Cookie (series) by Barbro Lindgren – One of my personal favorites for my Sam. If a two-year-old could write books about his life, this would be the product. Dr. De Soto by William Steig – So very fun and clever – for grownups as well. Billy and Blaze (series) by C. W. Anderson – A boy and his adventures with his horse. Beautiful illustrations. Alfie and Annie Rose (series) by Shirley Hughes – Everyday life of a little boy and his toddler sister. A note about books for those new to (or hesitant to) reading: Reading fluently and confidently takes practice. For those who are hesitant, the goal is to build familiarity with the characters and storyline, so the child doesn’t feel overwhelmed. From a later book – Dan Frontier Goes to Congress. Words become smaller and reading difficulty increases. Dan Frontier by William Hurley – Probably the most iconic books from my boys’ early years. Although out of print, they are worth the hunt. The first book in the series, Dan Frontier, is written with few words and a large illustration on each page. As the series continues, there is a slow progression to smaller (and more) words on each page, and fewer illustrations. Readers become familiar with the characters and storyline, so they are less intimidated as the reading becomes more challenging. I should note that my son read a rather comprehensive biography on Daniel Boone, and Dan Frontier had strikingly similar friends and adventures. The Dan Frontier series provides plenty of exciting adventure and action. It may be my favorite. Jim Forest by John and Nancy Rambeau – A close second to Dan Frontier in our house. Titles like Jim Forest and the Bandit and Jim Forest and Dead Man’s Peak live up to their adventurous names. Thoughts to Make Your Heart Sing by Sally Lloyd-Jones – Because we all need to know that we’re part of a much bigger story. Every child (age 9-90) should have a copy of this book. Many of the Early Readers listed are out of print. However, you can find them fairly easily at addall.com, which is a virtual clearinghouse for used books. I’ve also stumbled upon great finds at ebay. Rick Brandt Electronic Adventures (series) by John Blaine – For your techno-boys. The Book of Dragons by Edith Nesbit – One of our favorites. Everything by Nesbit is worthy of reading, and of reading aloud as a family. She was the first author to bring fantasy into the everyday life of children (rather than children leaving our world to escape into fantasy). Incredibly well written and delightful stories. A favorite of C.S. Lewis. 100 Cupboards (series) by N.D. Wilson – I was significantly influenced by Wilson’s book, Notes From the Tilt-A-Whirl (if you haven’t read it yet, you should), and was delighted to learn that he had a series of books that my boys could read. Wilson masterfully explores the nature of good and evil throughout his books (I’m holding off on my 9-year-old reading them until she’s a bit older) – ancient truths wrapped in great story. We’ve become bona fide N.D. Wilson fans. Tom Swift (series) by Victor Appleton – Imagine James Bond – 007 written for children. Swift uses science, technology and adventure to save the day. Sneaky Uses for Everyday Things by Cy Tymony – Amazing, really. Many a contraption in my house was conceived here. Mini Weapons or Mass Destruction by John Austin – Learn to build Shoelace Darts, Clothespin Catapult, Penny Bombs, Airsoft Pen Poppers, Ping Pong Zookas, and more. Wingfeather Series by Andrew Peterson – Love. My son’s review is found here. Just David by Eleanor Porter – A poignant read-aloud for fathers and sons. You can download for free here. Teddy’s Button by Amy Le Feuvre – Perhaps the best explanation of the battle between good and evil that rages within all of us. Powerful message for adults as well as children. Grace embodied. Freddy the Pig (series) by Water Brooks – One of my favorite series. Great to read aloud as a family or individually. Freddy the Detective is at the top of our list. Little Britches (series) by Ralph Moody – If you’re looking for a father/son read-aloud, look no further. My husband has read through most of this series with the boys, and he’s enjoyed them as much (or more) than they have. Princess and the Goblin by George MacDonald – Don’t let the title fool you – great for boys. We’ll read this one again and again in the years to come. The Bark of the Bog Owl Trilogy is currently out of print, but you’re likely to find the books in your local library. Stay tuned for news of their 2nd printing later this year. You can find The Charlatan’s Boy and other great books by Jonathan Rogers here. Fiddler’s Gun and Fiddler’s Green by A.S. Peterson – Fiddler’s Gun has been one of my favorite reads this summer – full of adventure and heart. Due to the accurate portrayal of life, events, and language that took place during the Revolutionary War (and on pirate ships), these books are recommended for those over thirteen. Book club information including special pricing and discussion guide can be found here. Auralia’s Colors (series) by Jeffrey Overstreet – We just discovered this series, and my son insisted that it be added to the list. He described the books as a cross between the Susan Cooper and Lloyd Alexander novels. You can read Overstreet’s thought-provoking piece on “Christian” fantasy here. I’m so grateful for this book. Eric Metaxas, author of Bonhoeffer: Pastor, Martyr, Prophet, Spy, explores the lives of seven influential men. Their stories are different, yet each man’s life is marked by heroic, sacrificial service on behalf of others. If we want to fill our boys’ minds with stories that inspire, Seven Men is a great start. This is a perfect gift for sons, dads, and grandfathers. One of my personal favorites. This is our family read aloud this summer. It gets better every time. Visit Living Books Library for their “Top Picks for Boys” list. Take time to browse through the website. It is a goldmine for book lists, information about books, and authors. Bethlehem Books is a great place to find historical fiction. Trailblazer Books by Dave and Neta Jackson are historical novels which introduce heroes of the Christian faith. The website provides a map, timeline, and various other resources corresponding to the books. The Bandit of Ashley Downs (introducing George Muller) had a tremendous impact on my life, as well as many of the others Trailblazer books that we’ve read. Heroes: Then and Now published by YWAM has an extensive list of Heroes of History and Christian Heroes: Then and Now. The books about C.S. Lewis, Dietrich Boenhoeffer, Corrie ten Boom, and Eric Liddell are a few we’ve enjoyed. These are excellent resources. The “We Were There” series is full of action and adventure. Historical events are retold through the eyes of children. Although out of print, they are fairly easy to find. For a complete book list, visit here. A list of resources about children’s literature (including many of the “maps” I used to find these gems) is found here. Awesome! Thanks for this. I’m going to save this out for a perpetual reference. My boys are very young now, but this list will come in handy soon. Of course, I’m sure I’ll enjoy reading many of these myself . . . Indeed. This list includes many of my favorite (as well as some of my daughter’s favorite) books. I am so thrilled to see many of our favourites here. I had commented a couple of weeks ago about the importance of humour for boys so I am especially delighted to see the “Freddy” books and “Homer Price” listed. “Eddie and the Fire Engine” (Carolyn Hayward) was the first chapter book my son and I ever shared. The “Swallows and Amazons” series are so wonderful for setting a young boy’s mind alive to the possibility of real life adventure (as distinct from fantasy) – learning semaphore signaling to send secret messages, building the ‘best’ sled from an old go-cart and someone’s discarded old cross-country skis, and the thrill of finding a beach cave (forever known as “Peter Duck’s”) whilst on holidays, are just a few memories made as a result of reading them. Very silly, and fun, chapter book – “Mr. Popper’s Penguins” by Richard and Florence Atwater, the clever and amusing – with just enough tenderness, “My Father’s Dragon” by Ruth Gannett and author illustrated “The Fabulous Flight” by Robert Lawson come to mind. For boys who enjoy adventure, have a sense of mischief and a fondness for animals, “Rascal” by Sterling North is a great read-aloud. On a more serious note “The Silver Sword” by Ian Serralier is a story of courage and family love – set in Europe during WWII. And for mid-late teens, though we didn’t read them aloud, my son loved the “Hornblower” series by C.S. Forester – he describes them as inspiring a sense of integrity and courage within gripping adventures. Thank you for the inspiration you are bringing to the next generation of young boys. Others will be blessed as they take hold of your recommendations. Judy – Wonderful. Many of the titles you mentioned are new to me. Now I’ll be off on my own hunt for new books. On behalf of my children, thank you for taking the time to share such a great list! I second the “Small” books. They’re fun and amazingly instructive for little folks without being condescending. 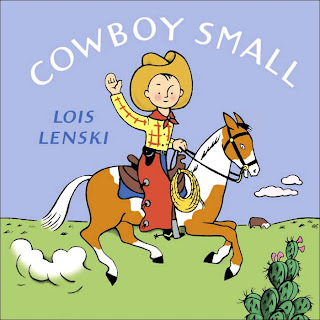 You just can’t beat Lois Lenski’s illustrations. So fun. And round. G.A. Henty is also a superb resource for the young adolescent chapter reader, his books are historical fiction. And Charles Dickens. I always go in to a Dickens book thinking it probably won’t be as good as his others since I’ve not heard of it (he has so many) and finish it thinking I can’t believe everyone’s not talking about it and I never read it as an older child. We Were There at the Oklahoma Land Run and We Were There at Pearl Harbor–love those two! My mom had most of the series (still does) as well as a number of biographies that I think we’re published by the same source. My seven-year-old loved the biography of George Washington and wants to read one about Abraham Lincoln “that’s the same.” I’ve got to track it down. And don’t forget Patricia St. John! Three of my boy-hero faves are Three Go Searching, Star of Light, and The Runaway. I love the “We Were There” series! Thanks for bringing up Patricia St. John. We’ve read Treasures of the Snow, but that’s it. Your three favorites will be high on our “next-to-read” list. I’m wondering if your biographies are by Genevieve Foster. Those are my favorites (both those for younger and older children). Please report back! That movie is fantastic, by the way. My two favorite parts: 1) When Prince Steren falls out of the tree and makes a splash in the peat moss. and 2) When the hungry alligator appears to eat Aidan. Love it. This summer, your books are getting their 3rd reading by my boys, and their 1st reading by my girlie. So fun (despite that fact that I’m allowing them to read books worth $100 according to ebay). Thank you for doing what you do. This is so valuable, Julie. What a gift. Thanks for investing so much time for so many. My family is benefiting from your wisdom, hard work, and generosity. Thank you so much. We (along with so many others) feel the same about you guys. It takes a village, doesn’t it? Great list, Julie. I’ll be sharing it about! I also love Richard Peck and Gordon Korrmann (particularly the Bruno and Boots series and Swindle). Richard Peck has a new book coming out that Sally Lloyd-Jones just got a preview of and said she really enjoyed – The Mouse with the Question Mark Tail, I think is the title. Carrie – Thank you! We’ll be looking forward to exploring those authors. I’m not sure why we haven’t read anything by Richard Peck yet, but we must remedy that situation this summer. I recommend Ralph Henry Barbour, who wrote many books for boys (and some for girls) in the early 20th century. They mostly revolve around boys at school and playing sports, although he also wrote some nautical adventure stories too. Their age occasionally shows, but by and large they are enjoyable, fun, light-hearted stories about school, sports and adventure that won’t be out of place in today’s setting, and they reflect good values and integrity. I think Barbour is hard to find in print form, but you can download many of his books free from Google Books. I would think they are appropriate for 8-10 years and up. Oh great – I’ll look forward to checking into his books. Thanks so much. A Tree for Peter is back in print by Purple House Press!! I just read it and it was wonderful. I’m looking forward checking out more of this list. I’m new to story warren, and I just saw this post on the sidebar. I’m so grateful it was there! I’m a long-time collector of booklists, but this list is full of stuff I’ve never even heard of before!!! Can’t wait to check it out Thank you! Thank you for the list, Julie. I love book lists, especially for boys, as I have three of them. Jim Kjelgaard and Walt Morey would also be excellent authors to include. And A Tree for Peter is back in print from Purple House Press. Love this! Is there a similar list for girls?